"I have often indicated that my economic roots come from Marx through Kalecki. Kalecki was a Marxist economist. Marx was the first to really get to grips with the idea of effective demand – that is, spending backed by cash. Kalecki understood this intrinsically." One of the problems with trying to classify like this is that there is much overlap. Yes, but then Michał Kalecki is usually taken to be within "broad tent" Post Keynesianism. Bill Mitchell is not alone in being influenced by Kalecki. Also, did Kalecki really accept the labour theory of value? I've read that he did not support it, which makes him a rather unconventional Marxist. He did not support the LTV. Michal Kalecki is usually classed as PK. But can also be classed as neo-Marxian. Note the difference between being a Marxian and a Marxist. The latter are the LTV crowd. You could call Robinson a neo-Marxian too by this logic. I just think we should stick with PK and note the influence when necessary. Same with Bill Mitchell. Not aware of any place in which Kalecki comes against the labor theory of value (LTV). If there is please quote. He developed effective demand on the basis of Marx's schemes of reproduction. His pricing story is clearly short run, and there is nothing that makes the whole cost of production tradition (including full cost and other Oxford ideas, where Kalecki did work) with some version of the LTV. Ed Nell has a nice paper on the compatibility of Kalecki and Sraffa's pricing theories. Ed is missing, isn't he? Also, the Kaleckian vs Kaldorian divide is based on growth theory basically. I would suggest that a more proper one (since many Sraffians would be close to Kaldorian, supermultiplier growth models) that you want a classification that emphasizes uncertainty and money as the source of persistent unemployment or the emphasis on real variables (with investment as derived demand) and the lack of a natural rate of interest, as per the capital debates as the source of persistent unemployment. In that respect MMT is just part of the first group, and many Kaldorians, Sraffians and Kaleckians would be in the same real group. My two cents. Oops, Ed is there as a Kaleckian, which is fine, but I would have put in the Sraffa column. His most important book is, arguably, The General Theory of Transformational Growth: Keynes After Sraffa. And real vs monetary views of effective demand has the advantage of not being by followers of an author. Also, Matias, would you be comfortable with being classified as a Sraffian Post Keynesian? Or if not, what category, if at all? I will answer your questions in the inverse order. 3) Lorie Tarshis goes with the "American Post Keynesians" (though a little bit more about that denomination later). 2) Austin Robinson was Keynes' personal assistant, he was a member of the Circus' group, and even though he didn't write much after his stuff on imperfect competition, I don't see any reason to exclude him from the group of Kaldor, Kahn and Joan Robinson. The same is NOT true of Meade, who really took a turn towards the neoclassical synthesis. 1) Eichner could easily be among the Kaleckians, but the case of Weintraub (and Tarshis) rises another point. Both of them were actually the pioneers of Keynesianism, when the term "post" was either non.existent or misused by Samuelson. I agree that they should stand by their own, though influencing the "fundamentalists", as Paul Davidson himself recognized it. (1) I think that PGB has it correct above. These guys were the actual Keynesians in America. They actually engaged with Keynes' work and appreciated what he was doing. Samuelson was a knock-off. It's annoying that we even need to call ourselves "Post-Keynesians". We should just be called "Keynesians". But unfortunately, that's how things developed. (2) Robinson can go in the Cambridge tent. Meade reminds me of John Hicks or James Tobin or Alvin Hansen. Less marginalist than Samuelson and more Keynesian, but still ultimately a marginalist. (3) Agree with PGB. He should go with Weintraub et al and these should influence the fundamentalists. Thanks for these comments: have added a new chart above in an update. Finally, any thoughts on where Evsey Domar would go? Domar should go in with Weintraub et al. He was an early North American Post-Keynesian. Will do up a final chart now. Done. Added a final update above. I'll put this on Wiki in a moment. How about adding an arrow from Godley to MMT ? The PK page on Wikipedia is really, really crap. Can you think of anything that we could do to improve it? Yes, it is short and looks like it needs a thorough revision, but it's a bit difficult to know where to start. I suppose more on PK policy recommendations? (e.g., full employment using fiscal policy, effective financial regulation, incomes policy, etc.). Also, more on why PK theory is distinct from and superior to mainstream neoclassical synthesis Keynesianism and New Keynesianism? Thanks for uploading it too. It looks good. If you're willing to do some posts on these topics I'll edit them and put them on Wiki. You'll have a lot more influence on newcomers this way and you can provide lots of links to your blog that will generate traffic. If you're up for it, of course. Sure, I'd like to help with this and will work on some posts in the coming days. J.E. King (1995), Conversations with Post Keynesians; J.E King (2003), History of PKE, and most importantly, F.S. Lee (2009), History of Heterodox Economics. Just to mention a few serious problems in your diagram, as far as the US is concerned, it was Eichner, Davidson, and Weintraub who founded the US PKE. They should be treated in the same way. Minsky comes later than those three. And MMT should be part of ``fundamentalist PK.'' Your diagram only includes PK macro. Is PKE just macro? No. You are ignoring all the PKs who do other than macro and money. Not to mention, Frederic Lee is a key figure who contributed to the development of PKE in the US and also in the UK since early 1980s. You cannot talk about PKE (and also heterodox economics) without Frederic Lee's contributions. Your another diagram on heterodox economics also has serious problems. Social economics and radical political economics are inexplicable parts of heterodox economics. You should not post present diagrams on the wikipedia. (1) this diagram is based mainly on Marc Lavoie's paper here, not on some eccentric personal view of mine. Perhaps Marc Lavoie's scheme for dividing and categorising PK economists is wrong? In that case, your argument is with him, not me. (2) yes, you raise a good point about Paul Davidson: I could put him with the "Early North American Post Keynesians". (4) The diagram is not meant to imply that PK economics is only macro. (5) you also make a good point about Frederic Lee: but I am unsure of how he self-identifies. (6) "Social economics and radical political economics are inexplicable parts of heterodox economics." If you can explain what you mean by "radical political economics", I'd be grateful. listed on the original diagram. I once heard Randy Wray say, "Marx was a Post Keynesian. And Keynes was an Institutionalist." Also, Edward Nell is hardly a "Kaleckian." Heavily influenced by Marx, Keynes and Sraffa, as well as Joan Robinson and Adolph Lowe, among others. Kregel is hardly a simple "fundamentalist Keynesian." Very influenced by Joan Robinson, Sraffa, and many others. By the way, Nell and Kregel are both modern money advocates, publicly and in print. I certainly do not consider myself solely an MMTer, by the way. Actually, I never even considered myself Post Keynesian (or even a macroeconomist! ), but by hanging out with PKers and organizing PK conferences I became associated with such. I have been influenced by and teach and do research in ecological economics, Black Political Economy, anarchist economics, Buddhist economics, and Adolph Lowe's and Robert Heilbroner's Political Economics. Marx, Sraffa, Classical Political Economy, feminist economics as well. Thanks for this comment, which does suggest that some people could be put into 2 categories. Do you feel comfortable being identified as a Modern Monetary Theorist? We have some agency with regard to certain aspects of our identity, for example I chose to become a Buddhist and to major in African American Studies as an undergraduate. But other aspects of our identity are imposed upon us by society, community, or history, irrespective of our wishes. To paraphrase Marx, people "make their own identity, but they do not make it as they please; they do not make it under self-selected circumstances, but under circumstances existing already, given and transmitted from the past." Where's Jamie Galbraith? And shouldn't Dudley Dillard be in there some place? Does James Galbraith self-identity as a Post Keynesian? Or as a non-neoclassical Institutionalist? (1) this diagram is based mainly on Marc Lavoie's paper here, not on some eccentric personal view of mine. Perhaps Marc Lavoie's scheme for dividing and categorising PK economists is wrong? In that case, your argument is with him, not me. After reading Lavoie's paper, I found I was right to say that ''you are making a history of PKE out of your own speculation.'' Apart from the historical-theoretical validity of Lavoie's classification, you made a choice of deleting ''Institutional-PK'' and adding MMT (which is not mentioned at all in Lavoie's paper). By deleting Institutional-PKs (although I am not 100 percent satisfied with this term), you completely ignore those PKs who pay more attention to micro issues. Also Lavoie lays stress on the importance of the interrelationship and cross-fertilization with other heterodox traditions. This point is completely ignored in your diagram. If you are just following what Lavoie says, your should use the term ''post-Keynesianism'' and you should place John King under fundamentalist PKs. But you did not. Above evidences reveal that the diagram is yours that delivers wrong and misleading information. Davidson, Eichner, and Weintraub are not just ``North American PKs.'' They are the founders of PKE. Before them there was no PKs as a community/school. The founders held close relations with Joan Robinson and Cambridge Keynesians, J.K Galbraith, URPE, AFEE, and ASE. See Lee (2009), History of Heterodox Economics, ch. 5. In your diagram, Tarshis and Domar are included in the ``Early North American PKs.'' Although they influenced PK thinking, they had no role in the formation of PKE. I was not talking about the age of Minsky and others. You should look at how one makes a contribution to a school of thought in a historical sense. 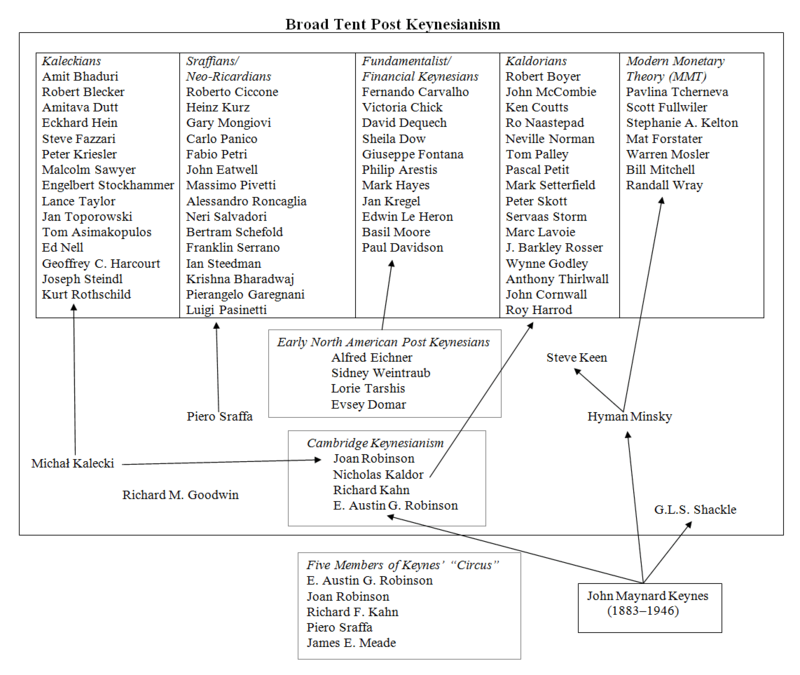 The beginning of PKE was the Newsletter established by Eichner in 1972, which was sent to heterodox economists such as Nell, Minsky, Don Harris, Fusfeld etc. Minsky was certainly part of the formation of PKE, but his major contribution to PKE was made later. And frankly I do not see why the MMTs should be classified as institutionalists. This is the only point on which I disagree with Lavoie. The MMT tradition draws on Minsky, Abba Lerner, Mitchell Innes, Cambridge PKs, and other PK traditions. Does, for example, Bill Mitchell regard himself as a mere "Institutional-Post Keynesian"? I read his blog regularly and he does no such thing: he is insistent that MMT is an independent economic school and says plainly that he was influenced by Kalecki. Also, the charge that I "making a history of PKE out of [my] own speculation'" is just silly. 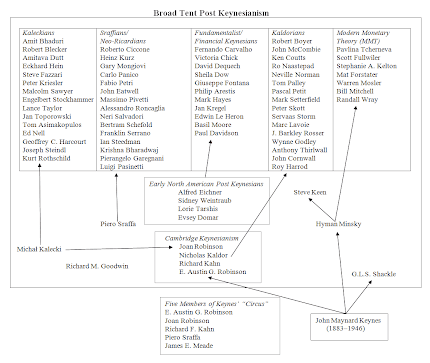 I have drawn on O. Hamouda and G. C. Harcourt's paper “Post-Keynesianism: From Criticism to Coherence?” (1988) to make the major bottom part of the chart showing the twofold tradition from Keynes and Kalecki. Meanwhile the main categories -- Sraffians/Neo-Ricardians, Kaleckians, Fundamentalist/Financial Keynesians, Kaldorians -- and the people in those categories come straight from Lavoie's paper. Both Philip Pilkington and Matias Vernengo have commented on the chart and neither is telling me that it is fundamentally flawed or some worthless product of "[my] own speculation". (2) I do not deny that Davidson, Eichner, and Weintraub had a role in founding PK economics. But so did Robinson and Kaldor. I am also mystified how you can say Tarshis had "no role in the formation of PKE." I have heard Geoffrey Harcourt say the precise opposite. "Minsky comes later than those three. Your gripe appears to be that he should be higher up in the chart to indicate his work was chronologically and historically speaking later than that of Weintraub? That is easily remedied. I will do so in corrected version of the chart. The present diagram is, whether you intended or not, only about PK macro. While Lavoie at least acknowledges a group of PKs (in his class of Institutional-PKs) who pays attention to the business enterprise, industrial organization, administered pricing etc, you don't. This gives a wrong impression to others that PK is only macro. The influence of G.C. Means, P.W.S. Andrews, among others on PKE cannot be ignored. This tradition continues in Eichner, Lee, Nina Shapiro, William Milberg, etc. I believe I know Frederic Lee very well. He is, first of all, a Post Keynesian---his essential contribution to PKE lies in Post Keynesian Price Theory (1998), theory of costs, production, market governance, linking micro-macro with a view of the social provisioning process (because of the last term some might say Lee is an institutionalist, but that's partly true). Lee has not only continued Eichner's legacy, but also developed PK theory in close connection to Marxian, Sraffian, Kaleckian, Institutionalist economics. Therefore I would say Lee, like Eichner, is a universal Post Keynesian or pluralistic heterodox economist who does not belong to a single PK stream. The fact is that most early PKs in 1970s and 80s held about the same position. The division of PKs is relatively new---partly because of sectarianism. Lavoie holds a similar (that is, non-sectarian) view. See the Lavoie's paper and Lee-Lavoie (2013), In Defense of Post-Keynesian and Heterodox Economics. (6) "Social economics and radical political economics are inexplicable parts of heterodox economics." If you can explain what you mean by "radical political economics", I'd be grateful. Social economics and radical political economics are distinctive heterodox schools of thoughts represented by Association for Social Economics and Union for Radical Political Economics. They are part of heterodoxy and helped the formation of PKE. They have longer history than PKE. I'd suggest you go their websites and see their history. For the history of radical political economics see Lee's book (2009). Lastly, I urge that you take the diagram down from the Wikipedia. Many scholars do not trust wikipedia entries because of such a misleading or distorting information made in public as if it is valid. The chart above would simply be too cluttered if I included the non-neoclassical institutionalists, many of whom, as far as I understand, do not explicitly self-identify as Post Keynesians, even though they draw on PK economics. (5) on this issue, it is easy to fix: one could add a further category of "universal Post Keynesian"/"general Post Keynesian". (6) these people are already covered by broader chart I link to in (4). And in point of fact, it was Philip Pilkington's idea to upload this chart on Wikipedia. He was the one who did this and I had nothing whatsoever to do with it, and wouldn't have the foggiest idea of how edit Wikipedia, so perhaps you should take that issue up with him. Maybe an interesting work to do in light of this diagram is to look at how some authors have tried to reconcile different branches of the PK tradition (reaching integrated perspectives like the Keynesian-Sraffian framework developed by Pasinetti, Garegnani or Roncaglia, amongst others)? Maybe it would help understanding why some authors seem to fit in more than one branch? I've used your charts in my blog (in spanish). Good work (i miss in the chart "schools of economics" School of Salamanca :p bellow Austrians). Gracias por tus comentarios. Su entrada en el blog se ve bien. Gracias a ti! Me gusta mucho tu blog.